1. The spring hangers were 4 1/4inches long and .235 thick. 2. They were welded to a .125 wall thickness 2" x 2" square tube that was welded to the bottom of the main beam. 3. The replacement plastic bushings had worn through in less than 4000 miles. We upgraded to Dexter E-Z Flex suspension and used bronze bushings in the spring eyes and wet (greasable) bolts. We welded the hangers (.230 thick) to a piece of 2" x 2" (.245" wall thickness) square tube with gussets on both the inside and outside edges of the hangers. We did all this welding on the bench, which made the job a lot easier. After we welded the square tube to the trailer frame, we added a piece of 3" channel ahead of the front spring hanger and behind the rear spring hanger for additional lateral support for the spring hangers. We also upgraded from 1/2" U-bolts to 9/16" U-bolts. We thought our problems were over. A friend came over and inspected our setup and said "You've made a good start, but you aren't done yet!". He recommended adding an additional long leaf to each spring that goes from the spring eye center at the front of the spring to the spring eye center at the rear of the spring, replacing the light banding around the spring with heavier material, and replacing the .193" spring plates with .400" thick plates. We also decided to have a 5th spring made, in case we broke a spring while we were out on the road. 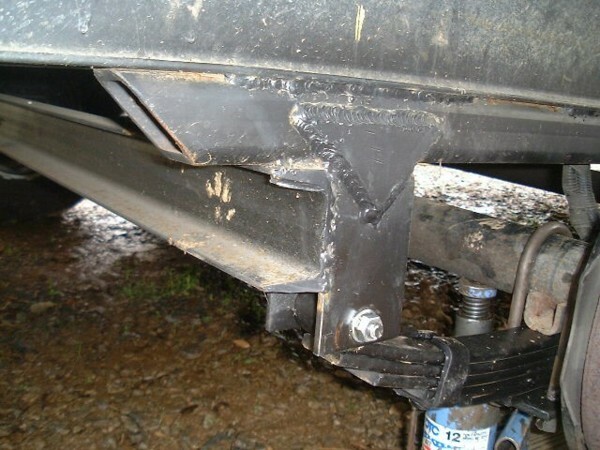 1.We learned that most trailers are built with the cheapest, barely adequate components the builders can find, and that frequent inspection is required to catch problems before they become failures. 2. 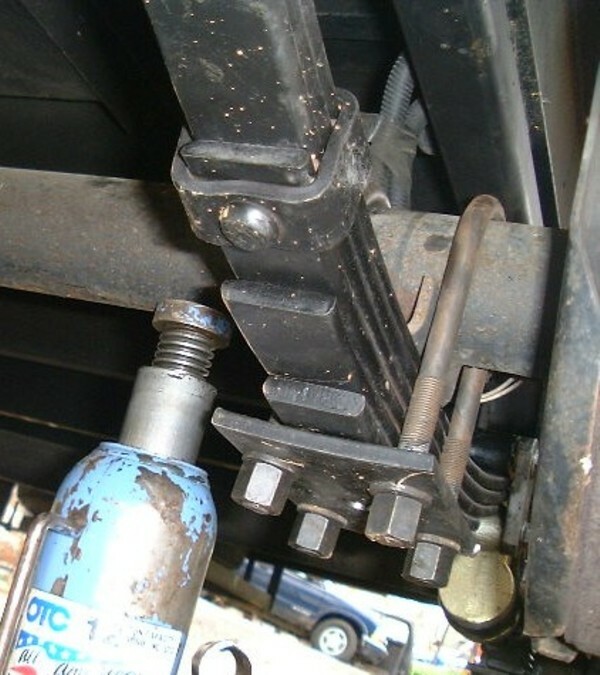 The most common failure points for the stock spring are where the second leaf contacts the main leaf near the spring eye and creates a stress riser, and near the center bolt if the U-bolts become loose. 3. The spring eye must be reamed to the correct inside diameter before the bronze bushing can be pushed in. If you push the bushing in without reaming the hole, the wet bolt will bind and you either won't be able to install it or it won't take grease. 4. Install the grease fittings on the inside of the spring, so it is easy to get to them when you need to give them a shot of grease. 5. Buying a spare spring costs about $40, and having the extra leaf added to it at the same time the other 4 springs are upgraded is relatively inexpensive. That way, if you break a spring, you can replace it with your spare, and just let the spare run, because it is identical to the other 3 springs. 6. The original replacement spring plates we purchased were drilled for 9/16" U-bolts, but when we torqued the U-bolts to 100 lb/ft, the spring plates bowed in the middle. When we inspected them after less than 4000 miles, they all had significant wear grooves from the edge of the spring rubbing on them. 7. Adding 1 leaf to a 1 3/4" wide spring like ours adds approximately 300# to it's carrying capacity, so we added about 1200# of capacity. 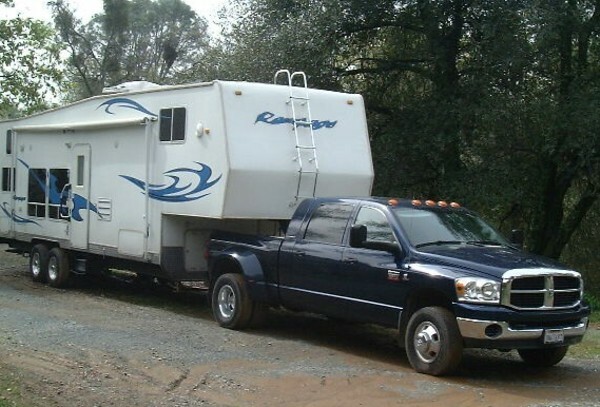 You need to consider the other components, such as bearings, wheels, tires, and brakes when determining how much you can safely haul. Sacramento Spring supplied the spare spring and did the spring upgrade. They also drilled the 3/8" spring plates for the 9/16" U-bolts. They do top quality work for reasonable prices. Dexter supplied the E-Z Flex Kit K71-653-00 E-Z Flex Complete Tandem Kit and the Heavy Duty Spring Hanger Kit HGR-271-00. They also have the drawing which shows the lateral reinforcement. Dexter tech support is excellent. 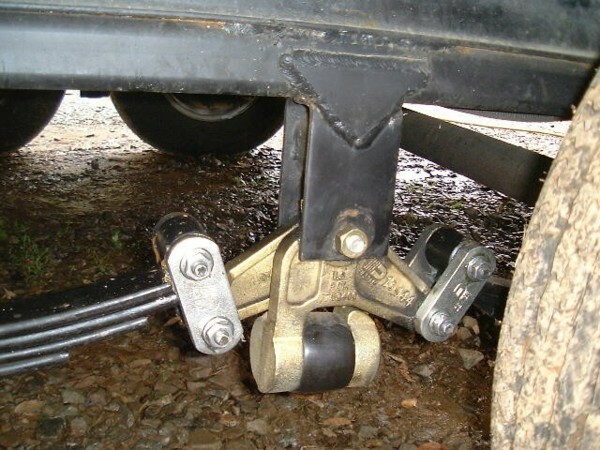 Trailer Suspension Upgrade article written by Joe Leonard. Copyright 2014. If you have any questions please contact Joe at: info@MoparTruckParts.com This article is written for informational purposes only, any vehicle modifications made by readers of this article are their responsibility.